In our neck of the woods, July and August are high summer and high summer means BBQ’s and camp outs. 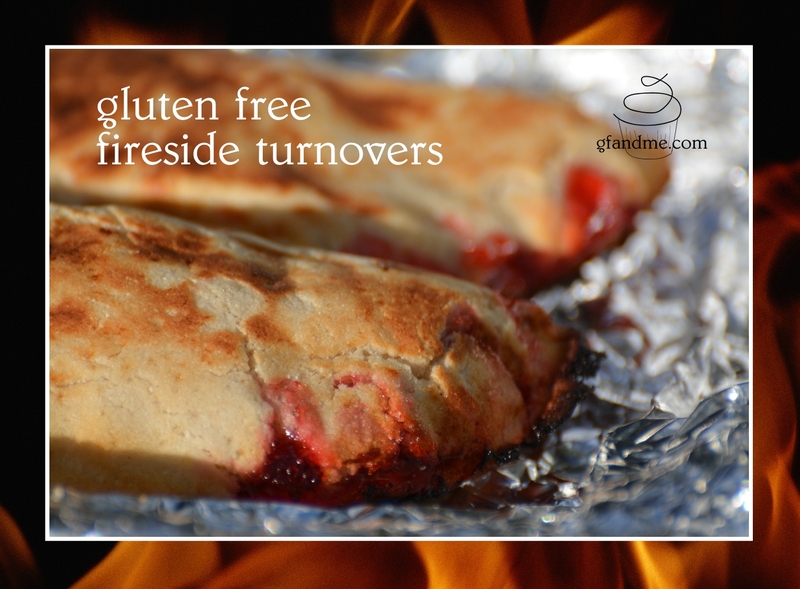 If you’re looking for a gluten free dessert to go with your next outdoor dinner, try these gluten free turnovers made in foil packets and baked on the fire or on your BBQ. Of course, they can also be baked in an oven but where’s the fun in that! This versatile gluten free pastry is made in a food processor and can be stored in a refrigerator or a cooler for up to a week before using. TIP: We don’t usually have this on hand so we use 2 1/2 tablespoons milk mixed with 1 teaspoon vinegar and let it sit for 5 minutes before adding. 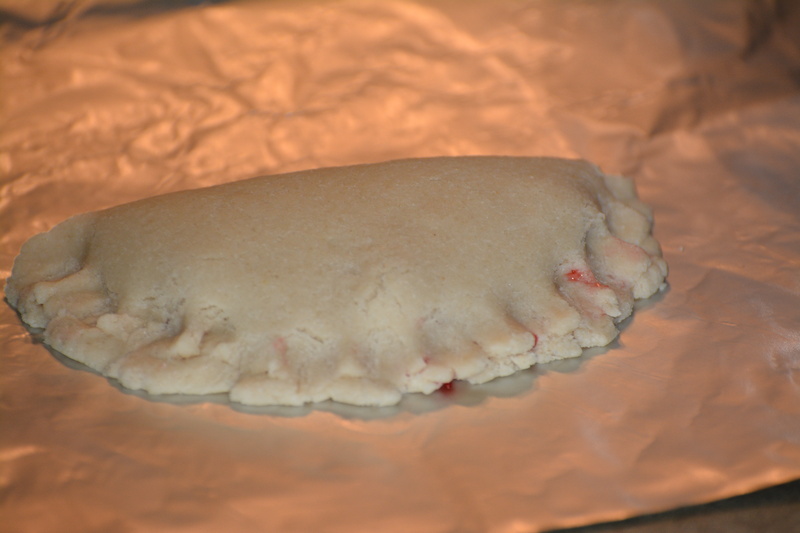 TIP: For the turnovers in the photo we used cherry pie filling. In medium bowl, sift together flours, xantham gum, baking powder, salt, and baking soda. Set aside. Combine the cottage cheese, buttermilk, sugar, melted butter, and vanilla in food processor. Process until smooth (about 10 seconds). Add flour mixture to the processor and pulse in short bursts until the dough clumps together. It will be soft and moist – don’t over process. Turn out onto a piece of parchment paper and knead four or five times until it comes together in a smooth ball. Use right away or wrap in plastic wrap and keep in the fridge for up to a week. Divide the dough into 4 portions. Roll out into a circle about 8 inches or so in diameter and trim to make a 7 inch circle or so. To help keep things from sticking, roll the dough out between piece of parchment or plastic wrap. TIP: When we are camping, we press the dough between two flat bottom plates. Butter the plate bottoms to keep the dough from sticking. Spoon pie filling onto half of the dough circle keeping the outer edge of the circle clean. Fold the dough over the filling to make a semi-circle and lightly press the edges together. Wrap in 2 layers of tinfoil and place on hot coals in your fire pit or on your bbq grill. TIP: To cook on the fire, you’ll want a fairly large bed of very hot coals. Bake for 10 minutes turning very frequently to keep the turnovers from burning. TIP: If you are cooking on open coals, you will need long tongs and a glove for this. Remove from heat and let sit a few minutes to cool down and to finish cooking. Enjoy! This would be even better with a light drizzling of almond glaze. This entry was posted in Baking, Drinks & Desserts, Recipes and tagged BBQ, campfire, coconut flour, food processor, pastry, tapioca flour. Bookmark the permalink. Thanks Ruralroutelupiac. I know you’re not into camping – or sugar- at the moment, so it means a lot!